On the road of innovation, Vertex is firm. In 2016, Laurence Wu launched Institutet of intelligent lighting design and application. 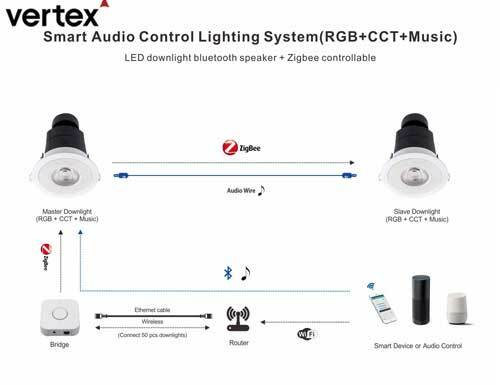 After the technical accumulation, the most bright spot of Vertex is the field of intelligent lighting. The "smart music dazzle light" is one example. Developed by the team, it is an intelligent day flower lamp that can be connected via Wifi, controlled by an app, and has more than 1500 light color changes and music functions. 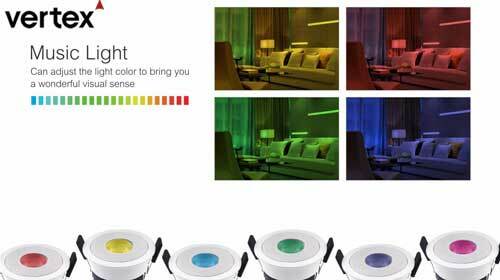 The success of research and development the intelligent music dazzle color lamp for intelligent lighting is a cross-border big breakthrough, to the user, lights can follow the rhythm or music rhythm, is very suitable for hotels, restaurants, bars, commercial and high-end residential use. It has one key operation, adjustable brightness, color temperature, remote control and other adjustable system functions so that the projected space and objects can produce different visual effects with the change of light. When music sounds, the sound, light, and color are integrated, pleasing to the eye, beautiful in shape and changeable in function. This is another contribution to the development of intelligent lighting. The power and lighting have been working intensively in three generations of intelligent product development phase, use more friendly, more than all the functions controlled by voice, and can call voice control, such as listening to the news. Economic theory points out that the four wheels driving economic development are human resources, natural resources, capital, and technological innovation. In China, the strategy of innovation-driven development and intellectual property rights has been put forward, and the direction of the transformation and upgrading of Chinese enterprises is continuous innovation. The development path of Vertex is a microcosm of China's private manufacturing enterprises. The experience of Vertex shows that Chinese enterprises can also take the road of innovation and development, also can rely on overseas patents to maintain their own rights and interests in innovation, can through overseas defense of intellectual property, patent protection to overseas market, take law as the weapons, to business, get out of the road of the characteristic of innovation and development. The dream of this Chinese private enterprise is also the innovation dream of all the Chinese people. Vertex focus on designing and manufacturing LED downlights, all downlights strictly meet the fire safety and electrical safety requirement of lighting, as our goal is to making home a better and safer place. We firmly believe that the spark can start a prairie fire, and the innovation of China will lead the world! If you want to learn more about us, please contact us, we will give the best service to you.